BLOOM sends email reminders to admins, executives, supervisors, and team members. 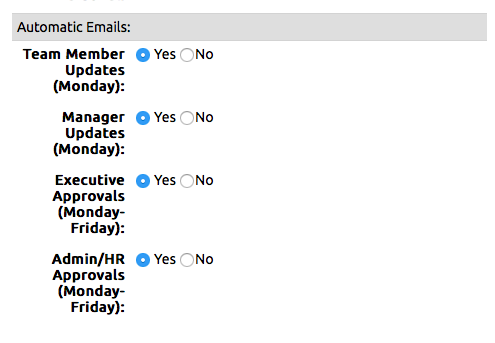 Go to the Automatic Email section and turn on the reminders that you want to have sent weekly. If everything is caught up (nothing is due or overdue) an email WILL NOT be sent. The team member must have a valid email address entered in their profile. The receipient will have the ability to unsubscribe from these notices. What: Shows performance dialogues, development goals, growth goals (Goals, Objective, Strategy, Tactics), and activities due/overdue. What: Shows pending approvals for all Role Changes and Performance Dialogues.